For most football fans around the globe, Real Betis (or with full name Real Betis Balompié) might be best known as the "other" Sevillan club. Indeed, their long-standing city rivalry with Sevilla FC makes for one of the fiercest and most historic derbies in Spanish football. And while Betis' trophy room is not quite as stuffed, the club did win La Liga in 1935 and two Copa del Reys in 1977 and 2005. Picture of the team in 1913. Betis was founded in 1907, under the name of Sevilla Balompié. 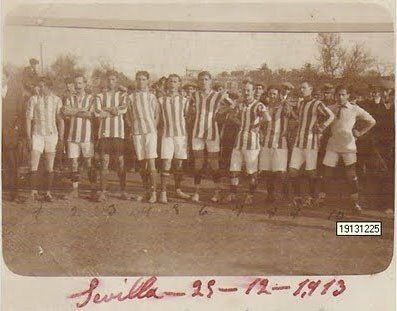 In 1914, the club was merged with Betis Football Club, a breakaway from Sevilla FC. From that moment onwards, the club has been known as Real Betis Balompié. The club switched to their now-famous green and white jerseys in 1920. A cup final in 1931 and a promotion to the First Division in 1932 set the scene for Betis' biggest success to date. With the Irish coach Patrick O'Connell at the helm, the club won its only La Liga title in 1935, beating Real Madrid by a single point. Unfortunately for the fans, this title was also the beginning of a slow decline for the club. Due to the dismantling of the winning team and a poor economic situation at the club, Betis found itself relegated to the Third Division in 1947. From a competitive standpoint, the seven years spent in the Third Division were the darkest period for the club. These were, however, the years of the so-called "Green March"; the loyal fans made sure their stadium was always filled to the brim, while at the same time showing up in large numbers for the away matches. With their unmitigated support, the club managed to return to the Second Division in 1954. Following a 21-penalty shootout against Athletic Bilbao, Betis won their first Copa del Rey in 1977. This trophy was soon followed by another financial crisis, but the club's fans once again came to the rescue by raising 400 million pesetas. In 1992, Manuel Ruiz de Lopera stepped in and saved the club from bankruptcy by becoming a majority shareholder. The club's next trophy came in 2005. Led by the Balearic manager Lorenzo Serra Ferrer, the club won its second Copa del Rey by beating CA Osasuna 2-1 in the finals. Through its history, Real Betis has used two distinctive logos. The first that was adopted in 1922, consisted of a circle with letters in it and a crown above. In the second (adopted in 1932), the circle is reshaped to a diamond and embedded in a larger triangle. After a modification in 1957, the diamond shape inside the triangle has returned to the original circle form.